The icon of Our Lady of Paisley, gifted to the people of the Diocese of Paisley by Bernadette Reilly, is touring the parishes of the Diocese in the lead up to our Diocesan Synod. It will be visiting St John's in March. As the icon of Our Lady of Paisley journeys around the parishes of our diocese, we are invited to spend time with the icon in prayer, reflecting on Mary’s own journey of life from the challenging moment when God’s messenger asked her to become the mother of God’s son until the wonder of his resurrection. We are invited to enter prayerfully into Mary’s life asking for the grace to be guided by her generosity, strength and compassion in our own life’s journey. Please download the prayer leaflet to make the most of your time with the icon. 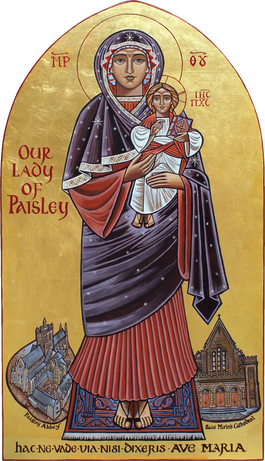 ​​Our Lady of Paisley, pray for us. Please note that the Church will be open all day from 8:00am to 8:00pm every day during the Icon's visit, beginning Friday 11th March.